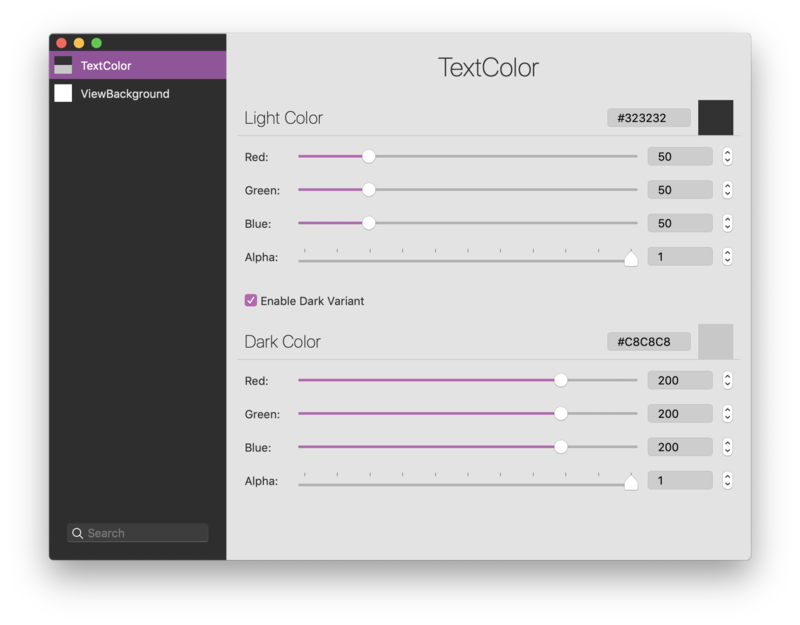 A macOS utility and framework allowing developers to manage custom interface colors with ease. Thanks to the ColorSet app and ColorSetKit, developers can easily support macOS Mojave's Dark Mode without dropping compatibility with older macOS versions. ColorSet is a macOS tool we built to help us add Dark Mode support to iMazing without dropping compatibility with older macOS versions. With XCode 10, Apple introduced custom colors in Asset Catalogs to help developers support macOS Mojave's Dark Mode easily. Trouble is, the feature is only available for apps which target macOS 10.13 and higher. The ColorSet app and ColorSetKit give developers a unified way to manage dynamic interface colors without compromising on retro-compatibility, all the way down to macOS 10.9. The ColorSet project is released under the terms of the MIT license. Enjoy! Along with the ColorSetKit Swift framework, the project also features a handy little app to easily edit and generate .colorset files. Written in Swift, the whole source code is also available on GitHub. Feel free to fork us!